Completed in 1875, the Currituck Beach Light Station towers above the northern Outer Banks in the historic coastal town of Corolla. Visitors to the lighthouse can climb the winding staircase (220 steps total) to the top for a magnificent panoramic view of Currituck Sound, the Atlantic Ocean and the Currituck Outer Banks. Inside the lighthouse, on the lower levels, there are museum-quality lighthouse exhibits. On your way up or down, be sure to stop to learn about the history of coastal lighthouses, the Fresnel lens, shipwrecks and the lighthouse keepers that looked after the facilities. 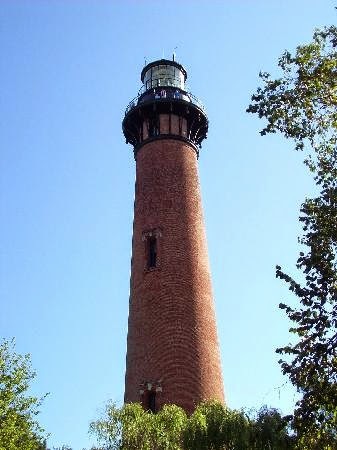 The Currituck Beach Lighthouse is a first-order lighthouse, meaning it has the largest of seven Fresnel lens sizes. With a flash cycle every 20 seconds, the light can be seen for up to 18 nautical miles away - the unique sequence enables the lighthouse not only to warn mariners, but also to help identify their locations. Like the other lighthouses on North Carolina’s Outer Banks, this one continues to serves as a navigation aid for mariners. The beacon comes on automatically every evening at dusk, operating continuously until dawn. To distinguish the Currituck Beach Lighthouse from other regional lighthouses, its exterior was left unpainted and gives today’s visitor a sense of the multitude of bricks used to construct the facility. The Currituck Beach Lighthouse is the last significant lighthouse built with bricks on the Outer Banks of North Carolina. The nonprofit Outer Banks Conservationists (OBC) was created to preserve the light station, the OBC has spent more than three decades and nearly $1.5 million from private funding restoring, maintaining and operating the lighthouse. OBC receives no government funds. The Currituck Beach Light Station is a member of Currituck Heritage Park, Historic Corolla and Historic Albemarle Tour. Corolla OBX NC Attractions, Vacation Rentals, Restaurants, etc.